View cart “Vintage Art Deco Side Tiara No.16501” has been added to your cart. A beautiful, vintage side tiara set with a central set vintage marcasite brooch adorned with dark olive green beaded flowers, surrounding a headband set with vintage rhinestones all along the band. Perfect for a vintage wedding. A beautiful, one-off bespoke gold vintage headpiece set with layers of guipure lace and pale gold beaded lace. Two gorgeous vintage gold leaf brooches are adorned with with a central set vintage rhinestone brooch. Perfect for a warm bridal glow. Set on a skinny (and comfortable) gold ribbon wrapped band. A stunning, statement vintage bridal headdress made with layers of guipure lace and pale gold beaded lace. Two vintage gold leaf brooches elegantly curve around a beautiful vintage gold brooch set with clear and amber rhinestones. Hand wired sprays of freshwater pearls finish the piece off beautifully. 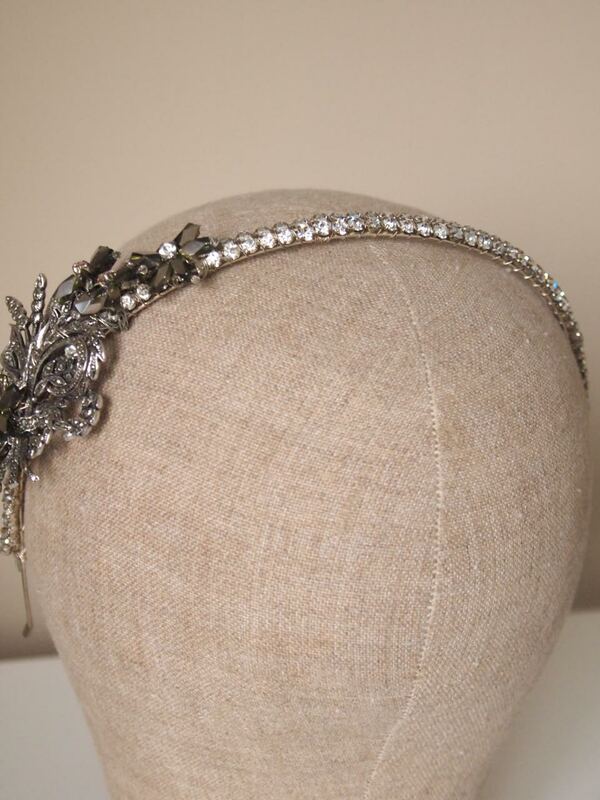 Sure to make a statement, this headpiece would look wonderful on a late summer or autumn bride. Set on a skinny (and comfortable) brown ribbon wrapped band. Stunning statement vintage side tiara made with a beautiful vintage gold brooch shouldered by a pair of 1930s vintage dress clips to form an abstract shape of a dragonfly in a beautiful Art Deco style. The band is wrapped in silver plated wire with freshwater pearls. 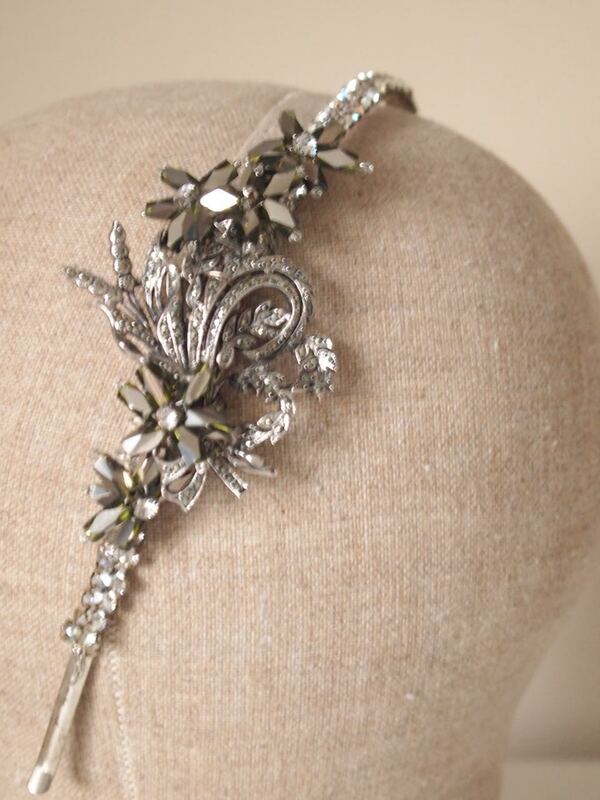 A very unusual, one-off piece perfect for an Art Deco or Art Nouveau vintage bride.